Waffles aren't just a breakfast food favorite— they're an obsession. The perfectly-toasted treat with the right amount of crispy-to-doughy-ratio is delicious especially when it's smothered in a concoction of butter and syrup. You could eat waffles every day for breakfast, lunch, and dinner if mom and dad would allow it, which brings us to the very reason why you need the Stranger Things Eleven child costume. If there's anyone who loves waffles as much as you, it's Jane Hopper AKA Eleven. You two have an unwavering love for waffles so the long pink dress makes for an ideal disguise. If you look like El's doppelganger, the waffles will just start pouring in. Onlookers don't know you're lacking psychokinetic and telepathic abilities or that you aren't the real deal so people will think, "we better get on El's good side by giving her a waffle or two." Jackpot! It's a foolproof Halloween scheme that'll earn plenty of waffles instead of candy inside your trick or treat bag this year. 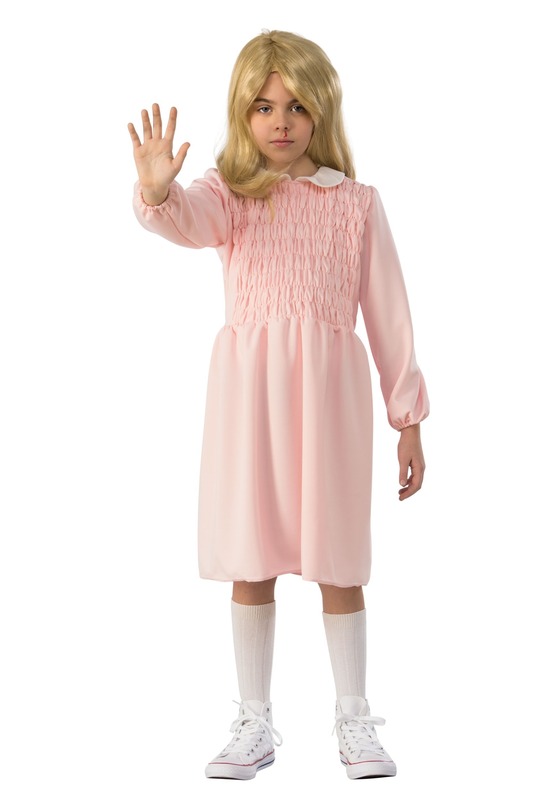 The officially licensed dress is made to be a replica dress which recreates Eleven's iconic look from season 1 of Netflix's popular show, Stranger Things. The knee-length dress is a beautiful baby-pink color which invokes a youthful appearance perfect for little girls. The costume dress features ruching in the bodice, elastic around the sleeve cuffs, and a white scalloped collar for a fitted look. If carrying out the waffle heist of a lifetime piques your interest then a few more accessories are needed to complete a trick that earns plenty of your favorite treat this Halloween. Finish off your Eleven disguise by adding white bobby socks and the coordinating blonde wig. Guarantee a waffle cornucopia by placing a line of fake blood underneath your nose for good measure then watch the waffles pour in!